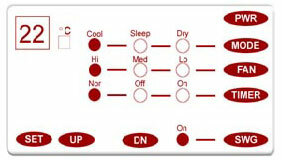 The Weather Craft STR is a high quality control unit for air conditioner based on the microprocessor technology. The high-speed microprocessor measures the temperature of the room and controls the hardware components to maintain the room temperature at +/- 1 C of the set temperature. Besides this, the IR remote control, built in timer function, sleep mode and dry mode makes the A/c easy to use and maintain. Freight, Insurance and Port Charges Included. High / Med / Low three kind of indoor speed.